Not sure if this has ever been posted, but I came across this April 21, 1946 article from the Cincinnati Enquirer magazine section, which I assume was written in anticipation of the Ellington tour. Some of it may be apocryphal but an entertaining read nonetheless. Here's a pdf version which might be easier to read. While I agree that we have to bear in mind that the racist tone may be symptomatic of the time it was written it's still a slightly uncomfortable read. And why point out that Django's wife was 250 pounds ? The source is probably Delaunay. Are you sure it is from Cincinatti Inquirer? It was originally found and shared with our community by Gatsby. 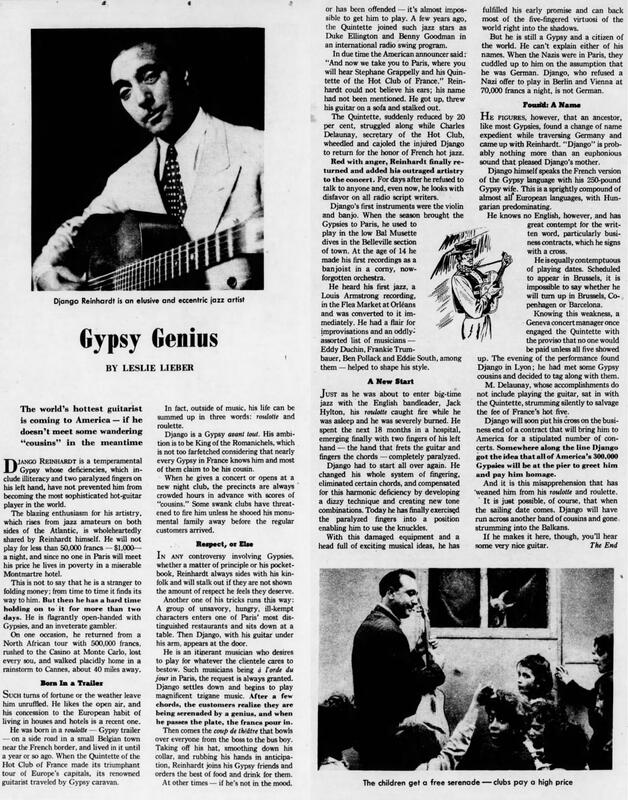 He found it inthe Los Angeles Times 21st April 1946, while doing research about the press coverage of Django's US trip . Thanks for posting, a great read. I enjoyed it. This discussion got way off topic and is now closed.